Looking for an electric, thrilling entertainment option this weekend? Check out the Escape Games Huntington Beach website for information about the most exciting escape games in the city appropriate for families and teams of all ages and experience levels. Looking to play an escape game room that you've never tried before? Our website has updated listings of the newest and most popular games with the freshest of themes. Rely on the reviews put together by our expert analysts who let you in on the in-depth secrets and information about the most exciting and memorable escape room adventures. So, which are the best escape games you can find in the city? We have expert feedback and reliable customer reviews to provide you with tried and tested details of each game. Imprisoned on a mistaken identity? Find the key left behind by a careless warden by deciphering a series of codes and clues that can help you escape with your skin intact. Huntington Beach! The name is self-explanatory when it comes to entertainment options. Most of the fun things to do here are centered around the beach. For instance, you could go kayaking or surfing and enjoy looking out for the local wildlife. There’s also the Surf City Comedy Club and tons of venues for trying varied cuisines and shopping. But, if you’re looking for an afternoon of pure, unadulterated fun and pulsating excitement, your choice would be the Escape Games Huntington Beach. Sign up to play the most challenging of games and come away with your appetite whetted for more of them. The CrossRoads Escape Games will impress you with their detailed decor and attention to intricacies. Your gaming experience will be made truly memorable with high-grade, refined puzzles that test your mettle. If you have always wanted to earn the title of Magician, try The Fun House. Of course, if you fail, you’ll only receive the Clueless Clown award. Aside from this carnival-based game, this Escape Games Huntington Beach venue has two other real escape games you can try. For instance, The Hex Room and the Psych Ward. If you’re an escape room buff, you’re probably familiar with EscapeX Rooms that are open in many locations. The venue has a collection of games you can attempt to crack including the Mafia Heist that is an advanced level game. For intermediates, The Attic is ideal and you can play this fun room escape game with up to 13 team members. These Escape Games Huntington Beach combine technology, special effects, and brain-scrambling puzzles that blow your mind. You will love the storyline, special lighting and sound effects, and an ambience that is well-crafted. The PuzzleMazement Escape Room is dedicated to offering gamers the newest of challenges and thrills. Accordingly, the organizers are constantly upgrading and refining their rooms. Each time you play a room, you’ll find a new range of codes and escape room clues to decipher. For instance, the Doll House is currently running, but the next time you might just get to try the Clowns room that is just a little more scary. 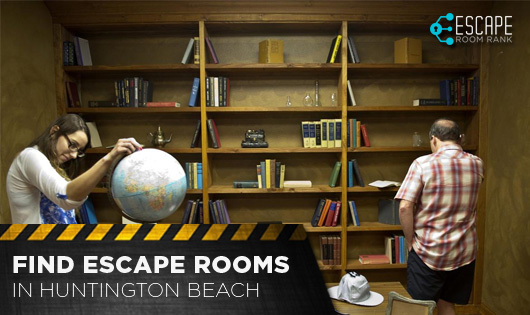 Other Escape Games Huntington Beach at this venue include the Mailroom Madness, Ghost Hunters, and the soon to open, Professor S! Here’s another franchise of escape games open in various states. They have rooms like Escape the Hydeout and Escape the Darkest Hour: Torture Chamber. Make sure you call in advance to make a reservation. That’s because the cluemasters like to set you up with the appropriate number of team players so you can enjoy the room thoroughly. Here’s another venue that likes to present new rooms, clues, puzzles, and themes all the time. The fun never gets outdated at Mission Escape Games. Are you an escape room veteran looking for the newest games to try your skills? Or, maybe, you’ve just heard about them and would like to try them this weekend. We’ll tell you just how and where to get started. All you need to do is contact us.